One of the scenes that's proving to be one of the most challenging shots I've attempted is capturing "Harold," everyone's favorite lovable and ferocious Abominable Snowman from the Matterhorn, perfectly clearly and crisply as the train rounds the corner and has a close encounter with the beast. I've seen friends who have nailed the shot, but I just can't seem to get the crispness and focus that I want. It doesn't help that I've never bothered to just ride over and over in front again until I've accomplished the deed, so it's still a work in progress. But here's a shot from the other day, when I almost got him focused and framed to my liking. Oh well... next time. 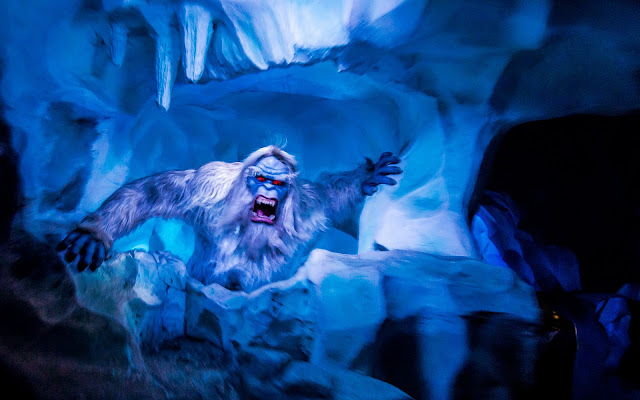 The Abominable Snowman attacks out of nowhere inside the Matterhorn Bobsleds.